Left atrial transit time (LATT) has potential to approximate left ventricular end diastolic pressure noninvasively. Small artifacts are often present in the down-slope portion of the time-intensity curve most likely due to poor SNR resulting from relatively low contrast dosing. While easily circumvented by experienced operator the artifact presents a challenge to automated detection of area under the curve (AUC) which is essential in the determination of LATT. To minimize user interface we sought to develop a filtering algorithm in the post processing and compared automated AUC detection with operator directed AUC assessment. Thirty seven patients (age: 54.1 ± 15.3, 9 females) were studied. All subjects underwent first pass perfusion using the SSFP saturation recovery sequence with ECG gating and breath-hold during gadolinium bolus injection at 0.01 mmol/kg. 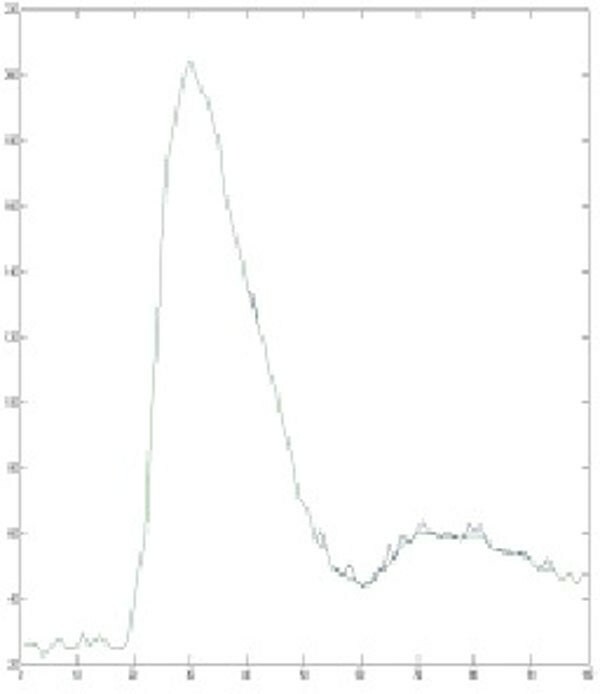 A time-intensity curve was generated by tracing and plotting the blood signals in the left atrium including all image phases and processed in a custom Matlab program with and without the filtering algorithm. The unfiltered and filtered AUC were compared to the operator directed assessment. 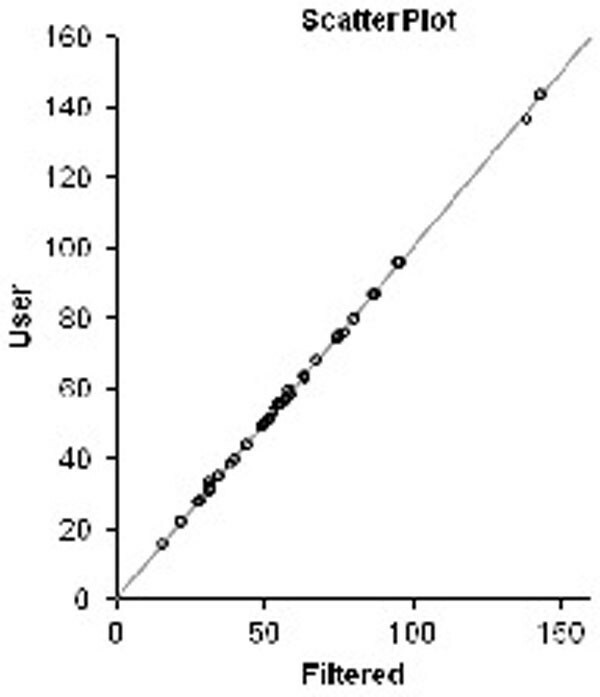 The example in Figure 1 shows a time-intensity curve from unfiltered data. Without filtering the AUC ended at phase 52 due to an artifact, while a filtered program detected AUC up to phase 60 which coincided with the AUC assessed by an experienced operator. Shows an example of original and filtered curves. Of the 37 cases analyzed, artifacts were present in 18 cases. The filtering algorithm was successful at detecting and removing artifacts in all 18 cases. As a result, the filtered AUC was much closer to the operator directed AUC shown (in green and in red, respectively) in Figure 2 than unfiltered AUC (in blue) was. 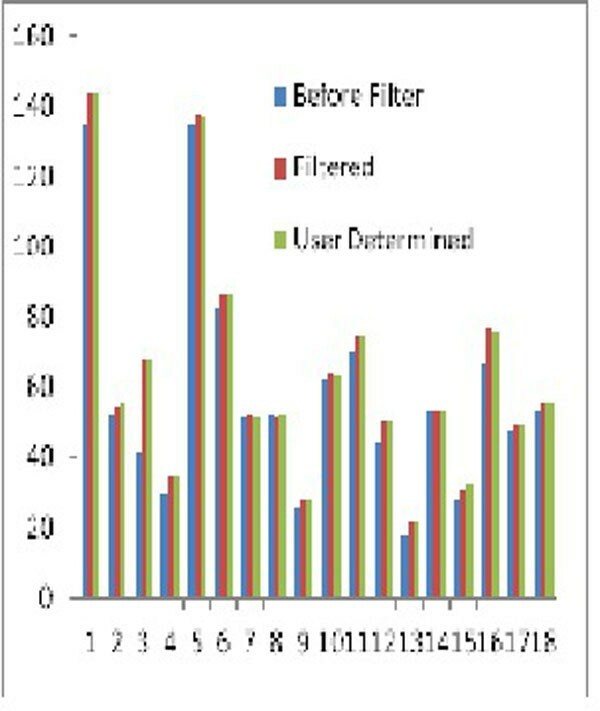 Bland-Altman analysis demonstrated a much improved agreement between filtered and operator directed AUC detection (Figure 4) than filtered and unfiltered AUC (Figure 3). Shows the AUC comparison in all 18 cases. 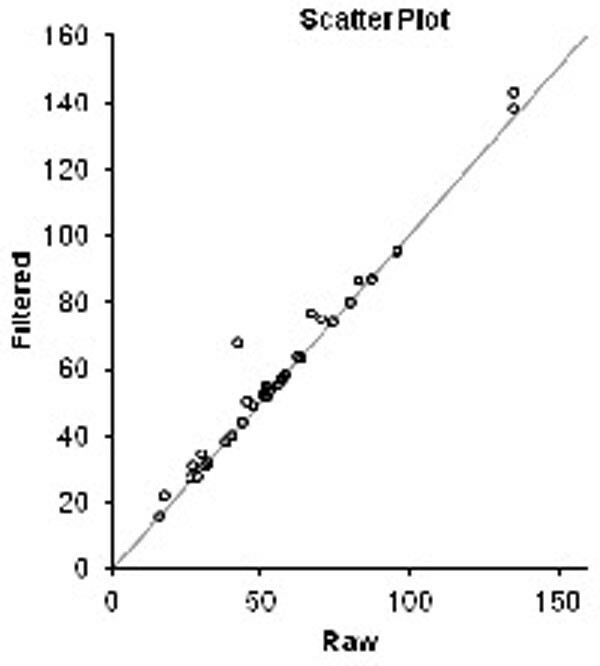 (left) Shows the Bland Altman plot of filtered versus unfiltered AUC. (right) Shows the Bland Altman plot of filtered versus operator directed AUC. Artifact is common in time-intensity curve of the LA blood signal. A filtering algorithm in the post process is promising to successfully remove the artifact allowing automated assessment of AUC.